When New York economics professor Rachel Chu agrees to spend the summer in Singapore with her handsome boyfriend, Nick Young, she has no idea the frugal academic is actually one of Asia's most eligible bachelors. Being a plus-one into the highest realms of high society might sound like a fairy tale, but the glass slipper cuts like a knife in this soapy Cinderella story. Kevin Kwan's trilogy reads like a binge-watch of Arrested Development while wearing a satin robe, eating McDonald's chicken nuggets and drinking Dom Perignon with a bendy straw. It's got a gigantic cast of zany, nasty characters, and enough twists and turns to keep you glued to the story. It deftly plays with tropes and bends genres, and reminds me of Shakespeare's comedies as much as it does a CW show. The members of Nick's huge family aren't just rich. They're so rich, anyone less rich than they are has no idea they exist because they've worked hard to be completely off the grid. They're so rich, they're guarded by Gurkha soldiers. They're so rich, they pick up stock tips at Bible study. Crazy Rich Asians examines every permutation of wealth and the petty ways the elite size each other up. As an American-born Dominican who spent her preteen years in her family's ancestral country, I can relate to being a fish out of water in a place where you look like you should belong, but you really don't. Rachel is ostensibly the main character, and her struggles with the scheming 1 percenters reminded me of everything I hated about Meet the Parents — I have a hard time watching one character endure a bunch of humiliating misfortunes. And Nick's mom, Eleanor, is definitely as scary as Robert De Niro. In many ways, Crazy Rich Asians is a story about whether love can overcome overwhelming odds. But the romance is just the cherry on top. It does suffer in some ways under the weight of its character roster, with little time between the scheming for anyone to be much more than a caricature. I was really intrigued after seeing the Entertainment Weekly cover story about the upcoming film adaptation starring Constance Wu. From the very first pages, I could see the movie in my head. I could imagine the types of shots, see the color palettes of different locations, picture the costumes, hear the soundtrack. And after finishing the entire series, I can't wait to see this in theaters, especially with that amazing cast. 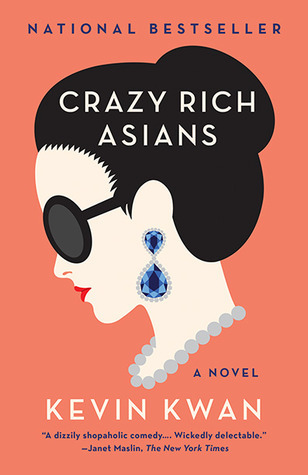 Crazy Rich Asians is one of those rare series in which the first book stands alone, yet none of the follow-ups feel like filler. You can choose your own adventure, but this one is worth seeing through to the end.